Composite satellite view on 23 September 2010 at 1345 EST showing water vapor in the atmosphere. Tropical depression #15, the remnants of Tropical Storm JULIA and now Tropical Depression LISA are identified. Three days ago in our posting “The Last Days of Summer 2010” we identified several tropical waves in the larger Atlantic basin including one approaching the Lesser Antilles, subsequently we questioned the potential for further development of the same tropical wave as it straddled the Lesser Antilles and started to penetrate the eastern Caribbean. 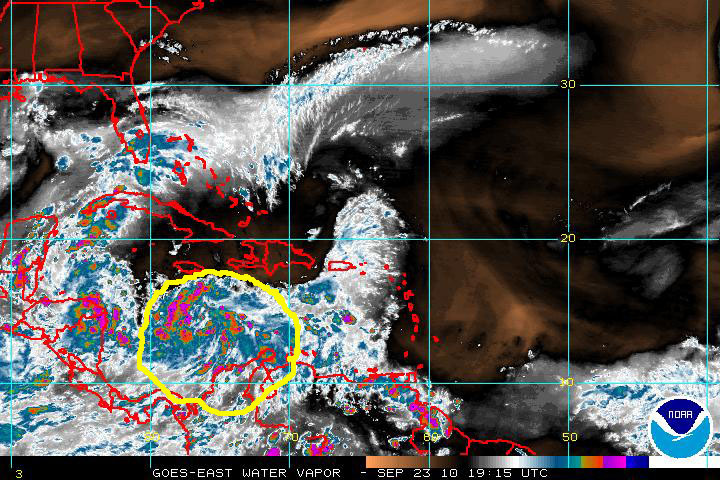 What was significant about this tropical wave then was its enormous size; here we had a system that was more than 1,100 miles long by more than 800 miles wide, quite large indeed! Today as if to mark the end of summer and arrival of fall this tropical wave got better organized and stronger as it became Tropical Depression #15 of the 2010 Atlantic hurricane season. As of 1400 EST the system’s “center” was located at LAT 13.9N LONG 76.2W moving toward the west with 35 mph sustained winds, placing it some 500 miles to the east/southeast of Cape “Gracias a Dios” at the border between Nicaragua and Honduras, and approximately 1,400 miles from Chetumal, capital of the state of Quintana Roo in Mexico’ Yucatan peninsula. 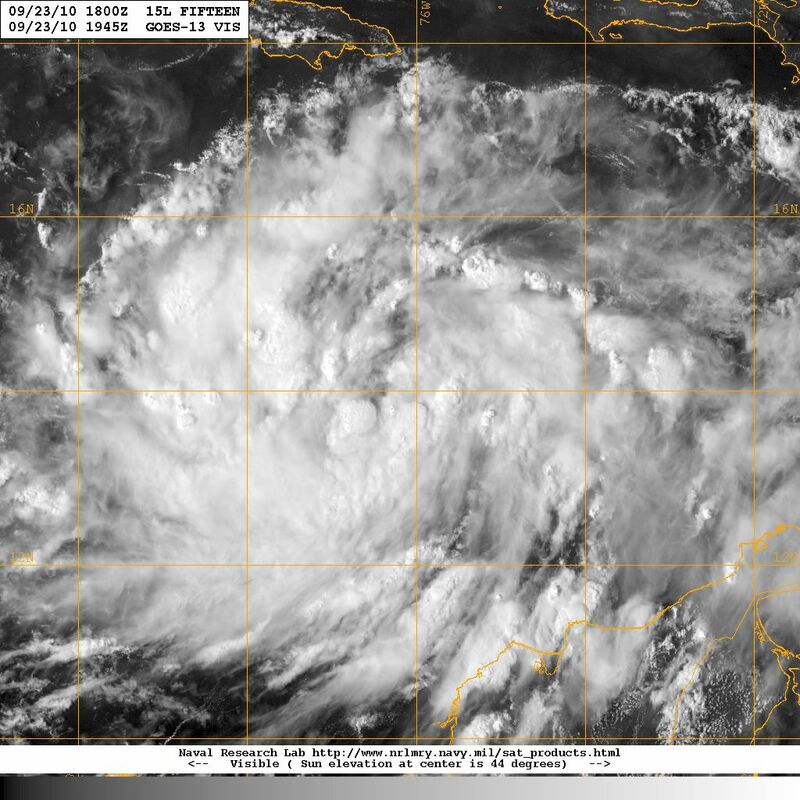 Visible light satellite view of Tropical Depression #15 on 23 September 2010 at 1445 EST. Map based on satellite remote-sensing observations showing sea surface temperatures. 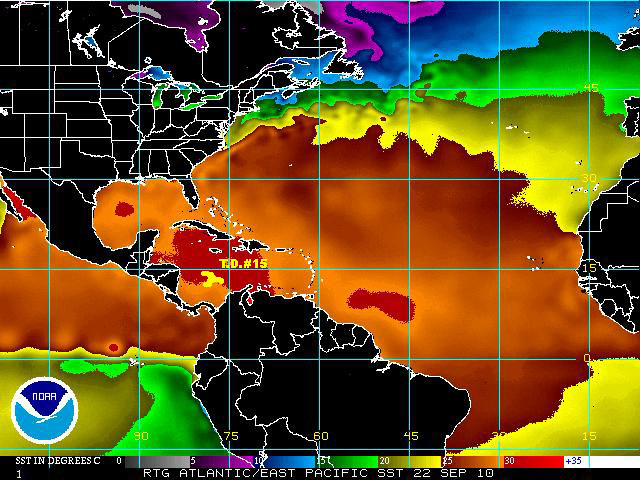 Notice how most of the Caribbean has the warmest surface waters. The position of Tropical Depression #15 is identified by the yellow icon and name. Tropical depression #15 continues to be quite a large system, which is moving over the warmest waters of the Caribbean into an environment with large amounts of moisture (precipitable water) in the atmosphere over an area than encompasses the Caribbean, the Antilles, all of Central America, northern Colombia and Venezuela, the eastern Pacific off the coasts of Mexico and Central America and peripheral areas. It is clear that between the warm sea surface waters, the large amount of moisture in the atmosphere, and the numerous thunderstorms and cells of disturbed weather in its immediate environment, Tropical Depression #15 has the potential for further development in the next day or so and the capacity for affecting quite a large area around the Caribbean basin and beyond. With the prospect for this cyclone to be a rain-maker, interests in Central America and the Yucatan Peninsula in Mexico, which recently suffered extreme rain and flooding with the passage of Hurricane KARL, and previously tropical Storm HERMINE, may be in for a repeat in the next one to three days. This is a reminder that WIND and WATER are the main damage components of a hurricane, and even when the wind does not cause much damage, extreme rain, and storm surge may lead to flash flooding in coastal regions generating large amounts of damage. Tropical weather outlook for the Gulf, Caribbean and Atlantic region posted by the National Hurricane center on 23 september 2010 at 1400 EST. Currently, on 23 September 2010 at 1700 EST, Tropical Depression #15 is tracking west at a rapid pace of 15 mph with sustained winds of 35 mph. It if continues along this track taking into account the degree of uncertainty, the margin of error in predicting the future path of the system, it is clear than Nicaragua, Honduras, Guatemala, Belize and Quintana Roo, Mexico need to consider this hazard a direct threat to its Caribbean coastal regions. However all countries surrounding the Caribbean basin should brace for the possibility of extreme rain events over the next couple of days. Keep visiting this site for updates and additional commentary on tropical depression #15’s future development and progress. Tropical depression #15 is now Tropical Storm MATTHEW moving west at 16 mph over the warmest waters of the Caribbean with sustained winds of 40 mph and higher gusts. Further strengthening appears possible in the next 24 – 48 hours.